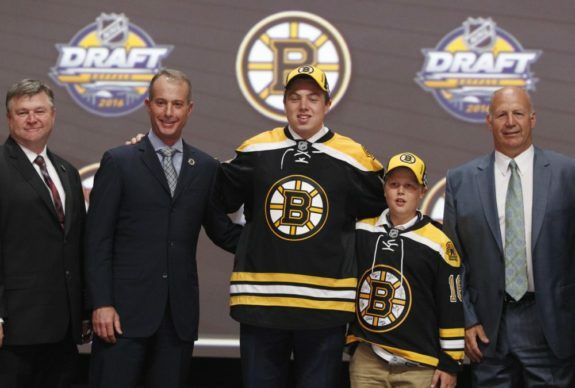 Ever since he was selected in the first round of the 2016 NHL Entry Draft, Charlie McAvoy has been considered the heir to Zdeno Chara’s throne along the Boston Bruins’ blue line. While it isn’t clear when the 42-year-old captain will hang up his skates, his successor seems ready for the challenge of filling them. Chara is a (very) big, shutdown defenseman with a powerful slap shot – a player perfectly built for the old NHL. McAvoy, on the other hand, has different yet appropriate skills for a powerhouse blueliner in the new era. His 6-foot, 208-pound frame ensures that he won’t be knocked off the puck or lose a battle along the boards easily. Matching his size with his speed, he has the perfect balance needed to be a two-way defenseman in 2019. While Chara is double McAvoy, the big man is still hanging in there, averaging 21 minutes per game. However, it seems as though the passing of the torch has already begun. Chara’s minutes have slowly fallen since McAvoy joined the Bruins, and the young gun is now taking on a heavier workload than the captain. In the first round of the 2017 postseason, the Bruins were matched up with the Ottawa Senators. 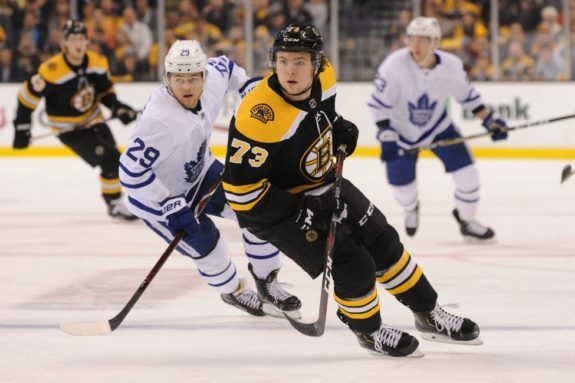 With their blue line lacking depth due to injuries to Brandon Carlo, Torey Krug, Adam McQuaid, and Colin Miller, McAvoy was signed by the team and immediately woven into the roster. The series was the then-19-year-old’s first dose of NHL action. The Senators ended the Bruins’ season with a 4-2 series win. Despite the loss, McAvoy shined. In six games, he averaged over 26 minutes of ice time per game, though many of those games required overtime (or multiple). While it was a disappointing end to the campaign, it was a great way to usher in their defenseman of the future. The teenager logged three assists, put five shots on goal, and took just one minor penalty and was one of the Bruins’ high notes during their short run. McAvoy displayed that his two-way game was solid enough to compete on a top-defensive pair at the top level of the sport. He appeared in 63 games during his rookie campaign in 2017-18. He nabbed seven goals and 25 helpers, seven of those 32 points coming on the power play. He was again slated alongside Chara from whom it’s safe to say he learned a thing or two: The 20-year-old was a plus-20 by the end of the season, blocking 80 shots and throwing 133 hits. Despite appearing in just over 75-percent of that season’s games, McAvoy finished in fifth place for the Calder Trophy. The blueliner performed well during the 2018 playoffs as well, helping the Bruins win a seven-game series against the Toronto Maple Leafs. They eventually lost to the Tampa Bay Lightning in five games, but during that 12-game stretch, McAvoy tallied a goal and four assists. The young defenseman had a great start to his sophomore campaign, registering a goal and five assists in his first seven games. However, he was soon sidelined, stating that he “wasn’t feeling right.” He was subsequently placed on injured reserve with what was deemed to be a concussion and missed the entire month of November as a result. Upon his return, he seemed slow. His offensive production dwindled and he was falling into a ‘sophomore slump’ defensively. During a time when big pieces of Boston’s core were out with injuries of their own, the 21-year-old was given more and more responsibility with only moderate success. McAvoy played a stretch of 10 games, nabbing five assists and averaging just over 21 minutes of ice time during that span. He was forced out of the lineup once again, this time by a lower-body injury. McAvoy missed the Winter Classic and made his return midway through January. Through the seven games he appeared in that month, he only managed to earn one assist. However, his play in his own zone was improving and he was trusted with more ice time, seeing as much as 25 minutes of gameplay in some matchups. Through Boston’s 19-game point streak from Jan. 29 to Mar. 3, McAvoy found his A-game. The Long Beach, New York native mustered four goals (three of which were game-winners) and six assists during the streak. He also averaged 22:38 in ice time per game and had a plus-11 rating. Since returning from his second injury of the 2018-19 season, McAvoy has been superb. He has clearly had a confidence boost, doing the things that made him a great player prior to the day he was drafted: jumping into the play, circling around the opposition’s net with the puck, firing a great wrist shot and quarterbacking the power play. His defensive game has also picked up, never seeming to get caught puck-chasing and always keeping his stick moving in order to thwart a dangerous pass. He’s also been physical along the boards, using his size to gain an edge over speedy forwards. Though they have yet to clinch a playoff berth, Boston is now just eight games away from the postseason. With five goals, eight assists, and an average of 22:45 in ice time in his last 20 games, McAvoy is heating up at the perfect time. Playoff hockey is vastly different than the regular season, but he has had experience in that environment. 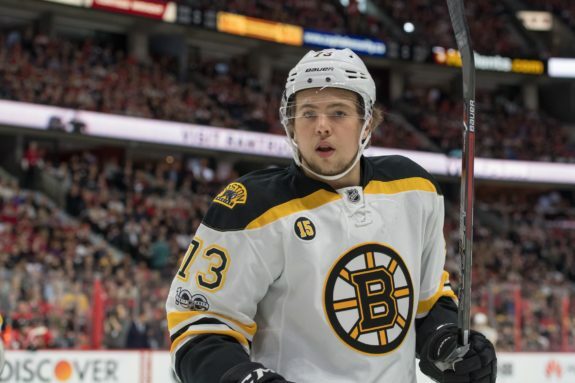 If he can stay hot, McAvoy could be the standout player of the Bruins’ playoff run.